Heat 1 tablespoon butter in a 12-inch skillet over medium-high heat. Add the squash and onion and cook for 7 minutes or until the vegetables are browned, stirring occasionally. Stir in the raisins, garam masala and remaining butter. Remove the skillet from the heat and let cool for 5 minutes. Sprinkle the flour on the work surface. Unfold the pastry sheet on the work surface. Roll the pastry sheet into a 12-inch square. Using a round cutter, cut the pastry into 15 (3-inch) circles. Place the pastry circles onto the baking sheets. Prick the pastry circles with a fork to within 1/2-inch of the edges. 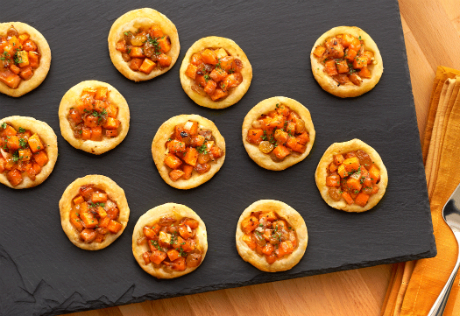 Spread about 1 tablespoon squash mixture on each pastry circle to within 1/2 inch of the edge. Bake for 10 minutes or until the pastries are golden brown. Let the pastries cool on the baking sheets on wire racks for 10 minutes. Drizzle with the honey and sprinkle with the parsley before serving.